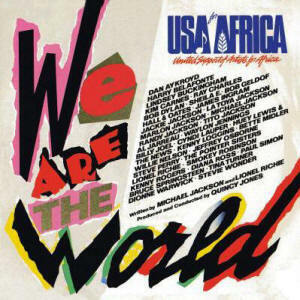 We Are the World by USA for Africa is part of the album "We Are the World (album)" . 'We Are the World' is a song and charity single originally recorded by the supergroup USA for Africa in 1985. It was written by Michael Jackson and Lionel Richie, and co-produced by Quincy Jones and Michael Omartian for the album 'We Are the World'. Following Band Aid's 'Do They Know It's Christmas?' project in the UK, an idea for the creation of an American benefit single for African famine relief came from activist Harry Belafonte, who, along with fundraiser Ken Kragen, was instrumental in bringing the vision to reality. Several musicians were contacted by the pair, before Jackson and Richie were assigned the task of writing the song. Following several months of working together, the duo completed the writing of 'We Are the World' one night before the song's first recording session, in early 1985. The last recording session for the song was held on February 28, 1985. The historic event brought together some of the most famous artists in the music industry at the time. The song was released on March 7, 1985, as the only single from the album. A worldwide commercial success, it topped music charts throughout the world and became the fastest-selling American pop single in history. The first ever single to be certified multi-platinum, 'We Are the World' received a 4× certification by the Recording Industry Association of America. However, the song garnered mixed reviews from journalists, music critics and the public. Fans enjoyed hearing racially and musically diverse recording artists singing together on one track, and felt satisfied in buying 'We Are the World', knowing that the money was going to charity. Other individuals, including many commentators in the rock press, were disappointed that the song did not challenge listeners as to why famines occur in the first place, and felt that the lyrics were self-aggrandizing. Awarded numerous honors—including three Grammy Awards, one American Music Award and a People's Choice Award—the song was promoted with a critically received music video, a home video, a special edition magazine, a simulcast, and several books, posters and shirts. The promotion and merchandise aided the success of 'We Are the World', which was eventually named the biggest-selling single of all time. As of 2009, it has sold more than 20 million units and raised over $63 million for humanitarian aid in Africa and the US. Following the devastation caused by the magnitude 7.0 Mw earthquake in Haiti on January 12, 2010, a remake of the song by another all-star cast of singers was recorded on February 1, 2010. Entitled 'We Are the World 25 for Haiti', it was released as a single on February 12, 2010, and proceeds from the record will aid survivors in the impoverished country. 'We Are the World' has demonstrated that diverse musicians can productively work together, and has further influenced the movement within pop music to create songs that address humane concerns. We Are the World Lyrics are the property of the respective artists, writers and labels. These lyrics are provided for eduacational purposes only. Please buy the song if you like them.